Los Angeles, CA, United States (4E) – Sports Illustrated model, host, and a mother-of-one, Chrissy Teigen, revealed in a new essay for Glamour that she suffers from post-partum depression. She said the depression she suffered through included both physical and emotional problems after she welcomed her daughter, Luna. The “Lip Sync Battle” host said one of the physical problems was her lower back pains, her shoulders, and her wrists. She also said she lost her appetite and it was surprising because she loves food and her fans know that. She went on to talk about her emotional problems such as being too short with people. Teigen shared, "I would be in my dressing room, sitting in a robe, getting hair and makeup done, and a crew member would knock on the door and ask: 'Chrissy, do you know the lyrics to this song?' And I would lose it." The 31-year-old said she did not realize she was suffering from post-partum depression after she could not figure out why she was unhappy. She also said she did not have anything remotely close to the feelings associated with post-partum depression such as not liking their baby. She said she is amazed by her daughter so she did not think she had post-partum depression. Eventually, she visited a general practitioner eventually and was diagnosed with post-partum depression. Her husband, John Legend, was with her during the check-up. Teigen revealed she is now recovering as she started taking antidepressants for more than a month now. She also has a therapist she talks to. The model said she decided to reveal about her condition because she said she wanted to let others know they are not alone. She said post-partum depression can happen to anyone and people who suffer from it should not feel embarrassed. Teigen continued to write on her essay she did not want to sound like she knew everything because it is different for everybody. For her, when she opened up about her situation, it helped her a lot. Alongside the essay of Teigen, a photo of her with her husband and their daughter was also posted. In the snap, Legend was looking at the camera while Teigen gave him a smooch on the cheek. 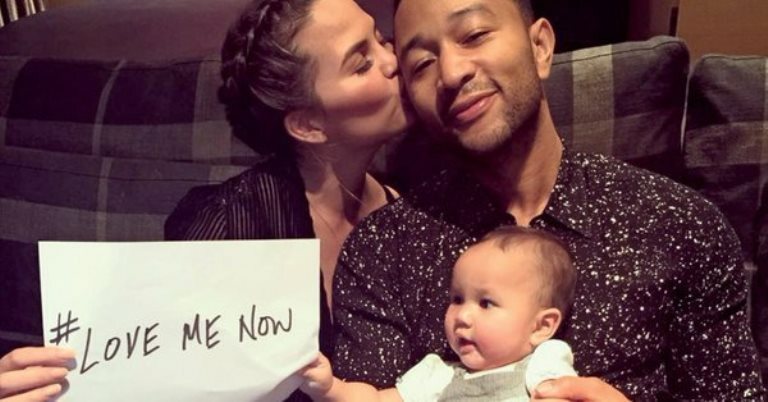 She also heldp up a paper with the hashtag “#LoveMeNow.” Their daughter was trying to reach the piece of paper held up by Teigen.